After a busy few weeks (more on which in a future post), it has been a pleasure to finally get back to hands-on archival research. I’ve spent a few days digging through the Hodson Shop archive of trade catalogues, seeking out links to any of the items I have encountered during my object analysis. Plenty have emerged as I’ve worked my way through piles of trade brochures for Birmingham wholesalers such as Wilkinson and Riddell, S.C Larkin and Sons and Bell and Nicholson. The images below are of some of the things that have caught my eye. They aren’t always hugely relevant to my research but they are the things that have raised some intrigue, a smile or a giggle. 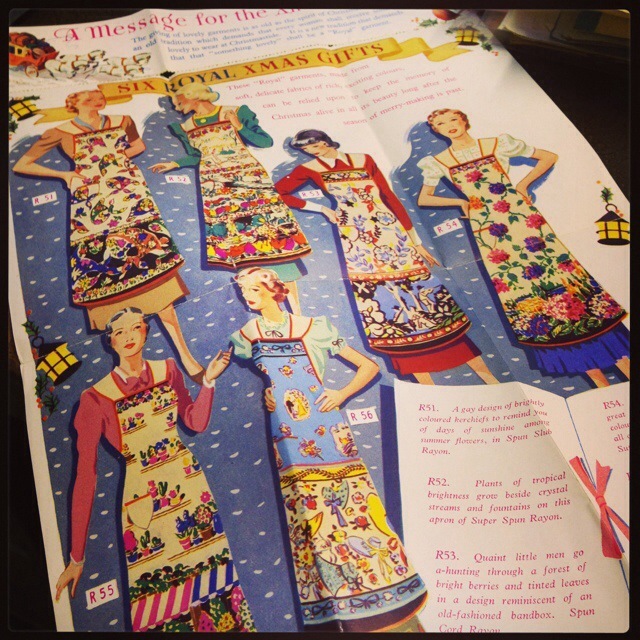 I’ve attempted to give as much detail as possible for each image, though I forgot to note the date and wholesaler for this Christmas apron image. I think it is late-1940s/early-1950s Bell and Nicholson, though I’ll double check when I am next at the museum and update the caption accordingly. I’ve posted before about underwear and how the collection highlights changing attitudes and approaches to undergarments from 1920s-1960s. The 1920s Queen of Scots promotional material is a prime example of this: hygiene and comfort, alongside endorsement from a pious historical figure (c.f. Cardinal Wolsey and his stockings). This is something that I really want to do some more research into (proposed paper title: Piety, Purity and Pants). If you know of any existing work on early-20th century underwear marketing, please let me know! Queen of Scots Underwear marketing material, 1920s. 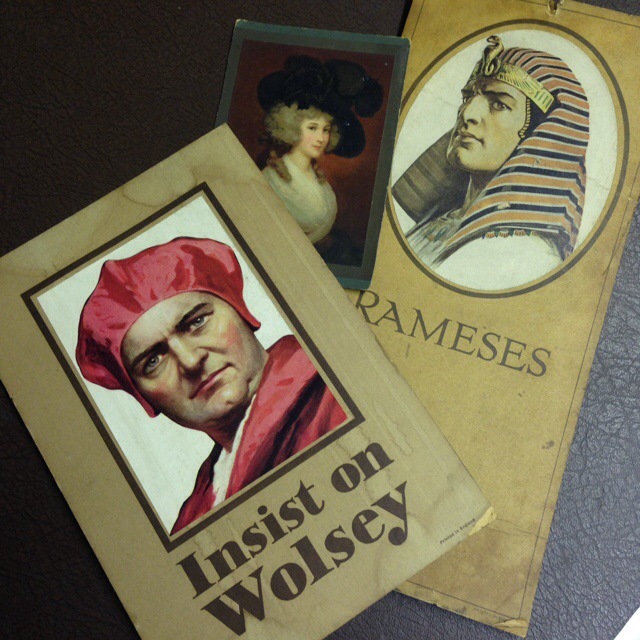 Display cards for Wolsey and Rameses hosiery and underwear. 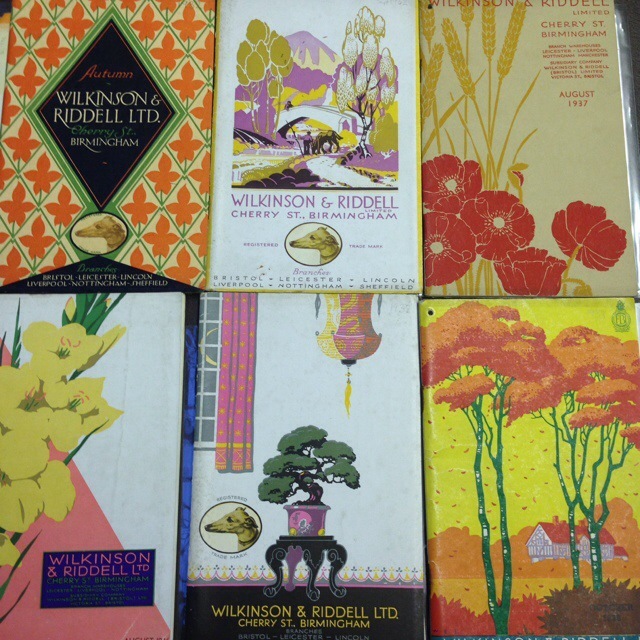 The 1930s Wilkinson and Riddell catalogue covers are especially stunning – with their Japanese influences and bold artwork. There is something rather charming about their Greyhound logo, especially when placed next to a bonsai tree. The pink and yellow gladioli cover is a personal favourite. Wilkinson and Riddell catalogues, 1932-1938. 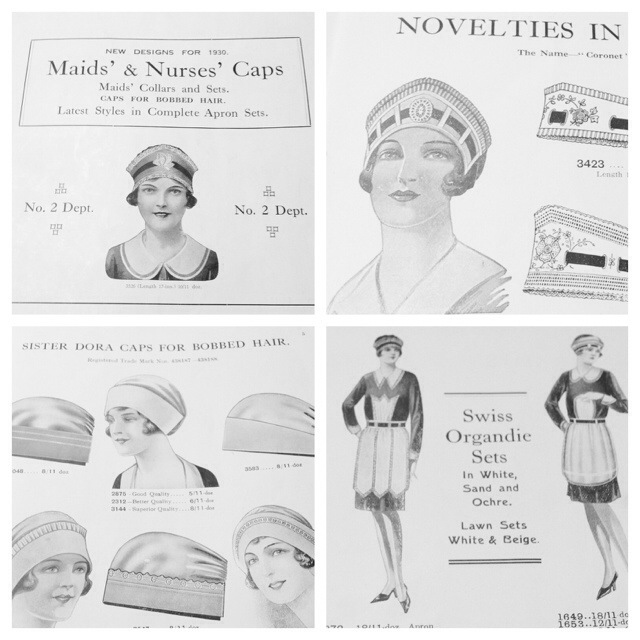 S.C. Larkin and Sons brochure for maids’ and nurses’ caps, 1930. The S.C. Larkin and Sons brochure, New Designs for 1930. Maids’ and Nurses’ Caps, revealed links to Walsall’s famous Sister Dora – the nurse and nun who revolutionised approaches to nursing during the mid-ninteenth century. She created a simple cap for nurses to wear and the brochure shows the design in a number of styles ‘suitable for bobbed hair’. The final image is of some scribbled notes that I found inside a 1954 Bell and Nicholson catalogue, possibly by Edith or Flora Hodson. 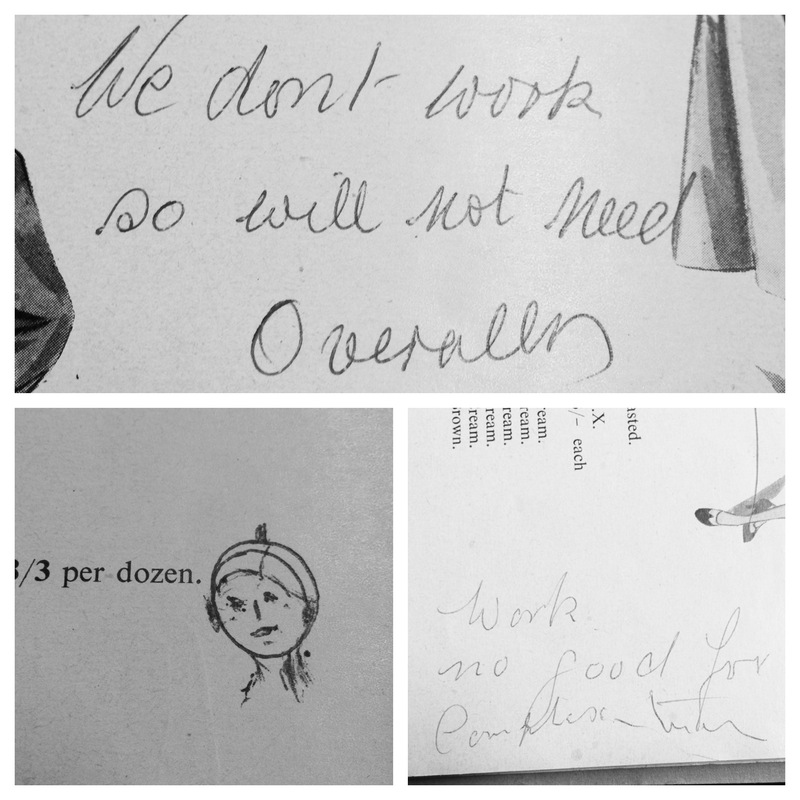 There was something eerie about coming across these notes and doodles – as if they were a direct link back to the women and what was going on inside their heads. I’ve seen their handwriting many times before but it has mainly been scrawled numbers or scrappy receipts. These notes seem more personal. And that little sketch of a head? Well, I’m filing that under ‘a bit creepy’. Assorted notes and doodles found in a Bell and Nicholson trade catalogue, 1954. Many thanks to Walsall Museum for providing me with access to the archive and for allowing me to photograph the items. 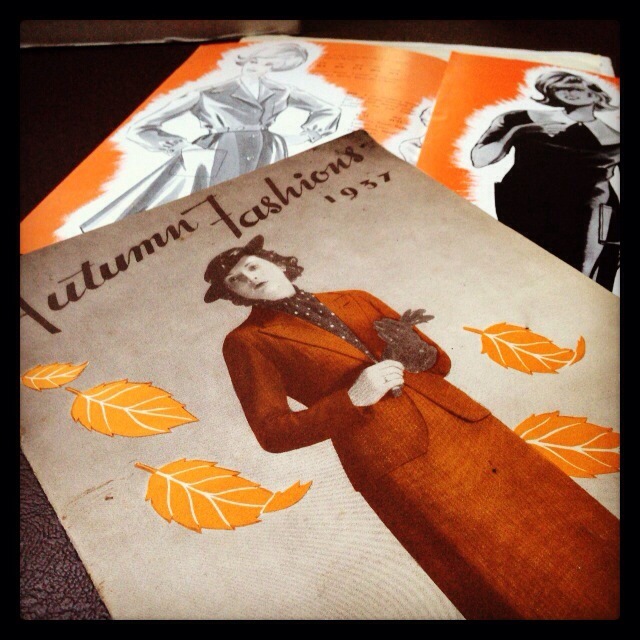 If you wish to explore the Hodson Shop Collection and Archive, please contact Walsall Museum.